Without the slightest hint of fear in her 11-year-old steps, Christy Glenn walked directly toward Arthur Ashe upon his late arrival at the Huntsville International Airport. Glenn, the 1991 Alabama Girls 10s state tennis champion, had patiently outlasted all of the other junior players who had gathered Friday evening to welcome Ashe. His plane arrived more than six hours late in the Rocket City, where he was to appear at the Huntsville Classic Celebrity Tennis Tournament. So, like the good baseliner finally sensing an opening, Glenn made her move, approaching the group of adults responsible for bringing Ashe to this benefit for the Huntsville Hospital. “I want to ask him a question,” Glenn announced as Ashe first became visible in the gate’s long skyway. Some of the adults started getting nervous. One man’s face mirrored the look of the Dallas police officer handcuffed to Lee Harvey Oswald when Jack Ruby made his fateful approach. Glenn, a Norman Rockwell model of an innocent child with a bow in her hair, remained polite and poised. But, as these politically sensitive adults feared, would she ask the “A” question? Was Glenn, as the adults feared, trying to become the next Barbara Walters instead of the next Chris Evert? More precisely, would she ask Ashe “A” question regarding the 1975 Wimbledon champion’s recent disclosure that he has been battling Acquired Immune Deficiency Syndrome for nearly four years? No matter how sensitive and caring these well-meaning people appeared to be, this scene reflected a fear of AIDS. But before the adults could ask Glenn her question, Ashe had entered the gate and was standing in the corner with a member of the group. Ashe’s eyes were obviously tired and his face drawn from waiting inside the Charlotte Airport for five hours while his plane’s mechanical difficulties were being corrected. Even more obvious, though, was the unquestionable fact the currently incurable AIDS virus had begun its assault on Ashe’s body. 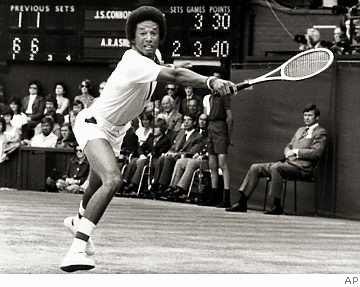 The hands, arms, feet and legs that had carried Ashe from the days of Southern segregation in his native Virginia to the top of a new tennis world –minus the racial barriers he helped remove — were drained of their former power. To see up close that a simple blood transfusion for a second heart bypass in 1983 could bring upon Ashe a disease once passed off by the ignorant as “God’s revenge on homosexuals” was truly frightening. This time AIDS, just as it does each day all over the world and in all walks of life, was physically ripping apart someone we knew. Right before our eyes, AIDS was — without trying to soften the reality — killing someone 11-year-old Christy Glenn admired. Glenn, seemingly aware of the adults’ unspoken fears, could see this devastation. But — possibly better than any other person waiting in Huntsville that Friday night — this little girl was able to look past all the fear and concern for Arthur Ashe the AIDS victim to see the spirit still living inside Arthur Ashe the tennis player. “I want to ask him a tennis question,” said Glenn, momentarily calming the adults’ fears on “A” topic that many, regardless of age, still find difficult to address. All she wanted to know, it turned out, was how much he practiced as a youngster. The next morning, as Ashe began his duties as the Huntsville Classic’s celebrity umpire, he was still touched by Glenn’s greeting and the depth of her 11-year-old vision. “I think that (Glenn’s welcome) is a very, very good example,” said Ashe of the change in perception for AIDS patients. “Two and a half years ago, the likelihood was maybe that little girl’s parents wouldn’t want her near somebody with AIDS. I go back to the Ryan White example. Though Ashe said he agrees there has been an upward shift in public perception about the disease since basketball great Magic Johnson’s HIV-positive disclosure last fall, the 1968 U.S. Open champion points out society still has many bridges to cross on the issue. “Magic did a hell of a lot, but there’s still a hysteria about it. No question, especially if you’re not famous,” observed Ashe. “There’s enough hysteria and ignorance about it that, one, there are a lot of people who know they are HIV positive who have not come forward. Ashe’s choice to disclose the facts of his illness, which has been well-documented since his announcement, was basically made for him by USA Today. The national newspaper threatened to bring the retired tennis star back into the public eye by reporting something many journalists had known for a great while. The episode, which has since sparked countless journalism ethics debates, will always be an invasion-of-privacy issue to Ashe. But, on the plus side, his previously private thoughts on AIDS may help the public in greeting those with the disease by showing concern instead of fear. “I had been through so much medically in the past (two open-heart surgeries, one heart attack) that it didn’t register the way you think it would have,” said Ashe of AIDS. “I’m not trying to be self-effacing or modest about it, but I literally didn’t lose any sleep over the fact I had AIDS until the night before my press announcement last month. While urge to explore new avenues of the world has grown, Ashe — as evidenced in Huntsville — has been careful to remain active in the arenas where people know him best. He still has much to offer a game that has taken so much from his example. 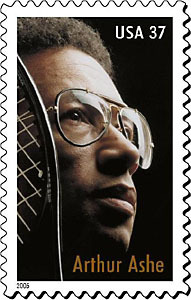 Today and possibly throughout the rest of time, Arthur Ashe can offer people — both on and off the court — the most valuable of tennis lessons. “The Huntsville Hospital benefit was scheduled long before my announcement, but these are the sorts of things following it that I have actually wanted to do,” Ashe stated. “To show people, hey, I’m fine, I can function normally and I’m not sick yet. “Sure, I have problems, but nothing that keeps me from maintaining my normal schedule,” he continued. “I also realize that it is instructive for people who are watching me. I guess people like Magic and I want to do what we can to help. Christy Glenn, all of 11 years old, had that message mastered even before she warmly greeted Arthur Ashe the tennis player on that Friday night. It was obvious in this battle of off-the-court emotions, joy scored an advantage on fear. That pride and dignity — no matter what attacks the bodily shell of the soul — can remain untouched by today’s most frightening of diseases. And Ashe certainly has much to be proud of on many fronts. Pride and dignity — even in the face of AIDS — can live forever.